A dance between the dark earth and the movement of life rising with the light of spring. As we played we imagined a snowdrop bulb opening its roots down deeper into the earth, and its shoot pushing its daring and tender way up into the light. One of my favourite tracks from this album. Heartful, tender, moving and gentle; a welcoming home waltz. 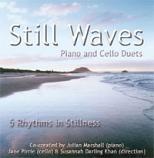 Originally made for dancing the 5 rhythms within the vibration of stillness, "Still Waves" is often to be heard on Movement Medicine dance floors, providing music of heart, dignity, gentleness and love. Susannah often uses the tracks "Homecoming" "Twilight" "Still Dancing" and "Vigil" for Wise Elder meditations. This is beautiful, spacious, acoustic piano and cello music. A journey through 2 waves of energy. Suitable for dancing, meditating, massage and moments in time and space. "I am deeply moved by "Still Waves". It is chamber music to ignite the Spirit." Marius-Christian Burcea, host and producer of radio show in Bucharest, Rumania.